In today's "Better Late Than Never" moment, MSNBC has just announced that Chris Matthews and Keith Olbermann will no longer act as anchors of the network's election coverage. Let me be the first to say that it's about time. After months of accusations of political bias and simmering animosity between MSNBC and its parent network NBC, the channel decided over the weekend that the NBC News correspondent and MSNBC host David Gregory would anchor news coverage of the coming debates and election night. 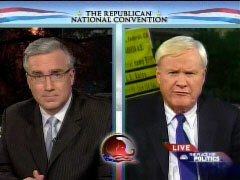 Mr. Olbermann and Mr. Matthews will remain as analysts during the coverage. The change — which comes in the home stretch of the long election cycle — is a direct result of tensions associated with the channel’s perceived shift to the political left. “The most disappointing shift is to see the partisan attitude move from prime time into what’s supposed to be straight news programming,” said Davidson Goldin, formerly the editorial director of MSNBC and a co-founder of the reputation management firm DolceGoldin. Readers are encouraged to review the entire piece, as it seems people chanting "NBC, NBC" on Wednesday when vice presidential candidate Sarah Palin referred to media bias during her speech at the Republican National Convention, as well as comments Olbermann made Thursday evening concerning a segment dealing with 9/11, were the straws that broke the camel's back. It goes without saying that this is indeed a happy day for the country and journalism. Now, MSNBC should do he right thing and cancel the disgraceful "Countdown." It really only seems a matter of time. Maybe most delicious, wouldn't it be fitting if Palin's comments Wednesday, along with the attendees' responses, drove the final nails into Matthews and Olbermann's coffins? That's what I call entertainment. As an aside, was Olbermann on tonight's "Sunday Night Football?"